Join us this week and next at GV art gallery for a full and exciting events programme to complement the Future Human exhibition. See Events for full info. Future Human plays with the possible, the probable and the implausible through an exhibition of interdisciplinary artworks, experiments and speculative designs, with an accompanying programme of workshops, demonstrations and talks. 18-20 June, 3.30-5.30pm. Free workshops for 11-16 year olds. Join the Broad Vision team to creatively explore the potential future of our seas, cities, and bodies. All materials provided. Decellularisation is a process where organs are stripped back leaving only the structure, which could potentially be used as a scaffold for transplant organs. Join London DIY Biohack group ‘The Kitchen’, Dr Mark Clements and Broad Vision students, to learn how artists and scientists are using this new technique, observe a live decellularisation of a heart, and have a go at making artwork with strips of decellularised bacon, dyes and glitter. Let your imagination run wild with a totally new art medium and learn about this amazing biotechnology technique. Book HERE. If the world as we know it ended and the survivors had to start again, how could we salvage, sustain and reboot civilisation? Lewis Dartnell, author of The Knowledge: How to Rebuild Our World from Scratch, will take us on a journey of discovery: a chance for us to reconnect with the basic skills and knowledge that our lives and world depend upon. 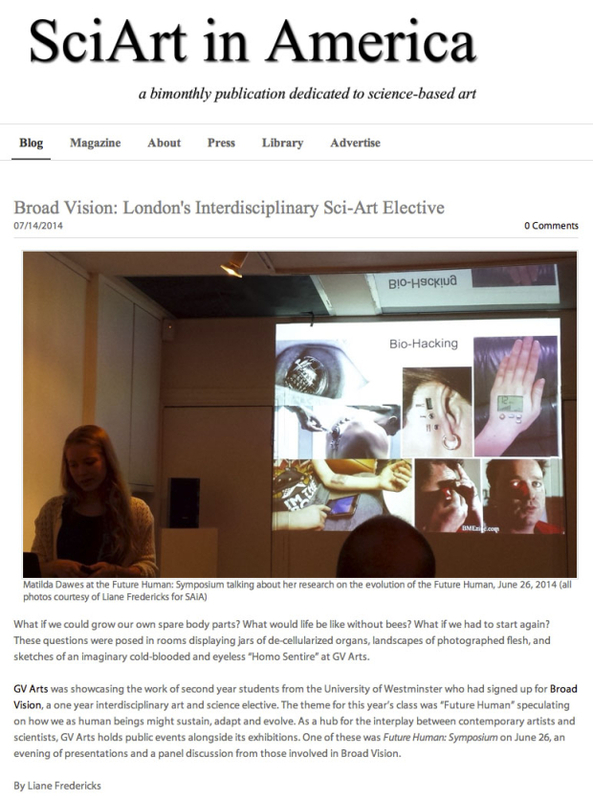 An evening of interdisciplinary speculations, presentations and discussions about what our futures might hold… brought to you by the Broad Vision team of artists and scientists, students and lecturers.